This newly restored Ahrens-Fox Piston Pumper from the early 1920s was on show at the SPAAMFAA Convention in August 2005. Is this the same model as the Ahrens Fox on display at Penrith in the Miseum Of Fire? Added by SO on 07 May 2006. It appears the same as the pumper at Penrith which is a PS2 but the only difference between the PS2 and another model IPS2 is one is chain drive and the other is tailshaft driven like all modern trucks. The PS2 is tailshaft driven. Added by Ron Hozack on 10 July 2006. The New South Wales Ahrens-Fox is a 1929 Model P-S-2, 1300 GPM, with the "gable" style hood, and no booster tank; 5-7/8" Ahrens-Fox Model "P" motor, the "old style" T-head. This is a 1931 Model N-T-4 with the rounded style hood, pump is 1000 gpm, and with a booster tank, has the "Revised" T-Head engine. Similar in apperance but may mechanical differences. Added by Ed Hass on 09 February 2009. 1931 ahrens-fox 1000 gal nt-4 piston pumper serial #3406 is for sale. appears to be a sister of this one - has rhd, 'out-door' hand-brake & gear lever, 6-cylinder engine, 4-piston pump, ex- taunton, massachusetts, fire dept. ed can fiil us in, on more details. otherwise, e-mail me, and I will send you the web-site. Added by Pat Rivers-Bowerman on 05 March 2009. The 1931 Ahrens-Fox #3406 that Pat Rivers-Bowerman mentions has been taken off the market, unsold, due to lack of serious offers. The owner will keep it (Tom LFaerriere was the agent for the owner). This same owner had a really nice 1923 Ahrens-Fox Model K-S-44 service lader truck, but because of its length, nobody wanted it (too big to store easily) and now it has donated its parts to save other, smaller Ahrens-Foxes. 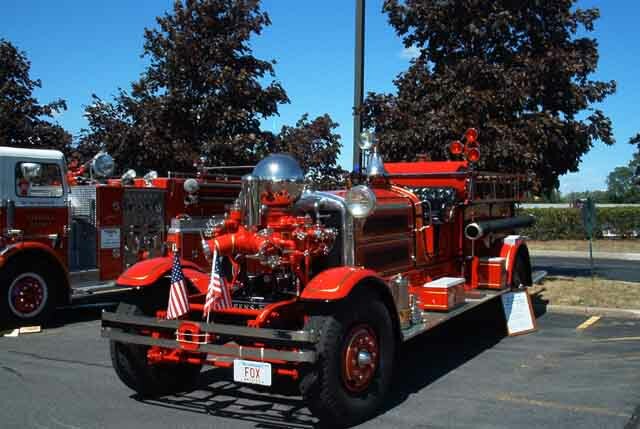 This was a rare model (not many big service ladder trucks with only 4 instead of 6 cylinder engine) and in nice condition, very restorable, but alas it is no longer. Thew big problem with Ahrens-Fox apparatus hasd always been, if it doesn't have the shiny silver ball on the front, nobody seems to want it. I've seen klots of good rotary and centrifugal pumpers, laddertrucks, etc., sacrificed to keep the piston pumpers running, and a lot of interesting rare rigs are no longer, because only the piston pumpers bring top dollar and sadly it's more about the money now than about preserving fire service history. Added by Ed Hass on 17 April 2009. Ed! I really agree with you! To the owners of Ahrens-Fox apparatus, wich NOT is a pumper! SHAME ON YOU!!!! Added by Anders Fallström on 10 June 2014.